Following in the wake first of our Hamptons scent in 2005, followed by Fire Island, Coney Island, and Andy Warhol Montauk, Sag Harbor is the fifth in our series of New York marine eaux de parfum. 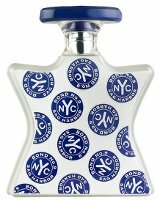 Its top-note is a Sag Harbor Bay accord surrounded by soft, citrusy bergamot and tart, evergreen ivy leaf. Then comes a garden bouquet of mid-notes. luscious peony, honeysuckle, and magnolia, blended with more tangy Long Island grapes. In a tantalizing finish, seductive base notes come into play. incense-like oud, along with amber and sandalwood from distant shores—reminders of Sag Harbor’s trading-post past. Bond no. 9 Sag Harbor is available in 50 ($180) and 100 ($240) ml Eau de Parfum, and can be found now at Saks Fifth Avenue. Grapes? Oud? Ivy? Amber? Together? Not appealing to me, but I have to assume someone knew what they were doing…. Sounds like a fruity aquatic, not my favorite category. I was a late-comer to the news about Laurice Rahme’s lawsuits against Anya’s Garden and Soivhole, so now any time I see a Bond No. 9, I will thumb my nose, give raspberries and do many other more obscene gestures. But most of all I won’t buy. I don’t think she ever actually filed a lawsuit…but I do know many perfumistas were pissed that she made them change fragrance names. She is a vituperative hag. I used the term “nubian slaves” on her website and she contacted my web provider reporting me for using “hate language,” and sent people to a website that competes with hers to spy on comments and plant nasty diatribes. The woman is a nut. Sag Harbor? That’s where I will be hanging out in my 60’s lol. Seriously, some notes get a yes, some no. And yes, def a fruity aquatic, no thanks on that one.